Room2Board Hostel and Surf School 10m South of Bahia Azul in front of the beach, Jaco Hotel Accommodation. The bedrooms and dormitories include bed linen and a fan. The bathrooms have showers and could be private or shared. At Room2Board Hostel and Surf School you will find a garden, a terrace and a bar. Other facilities offered at the property include a shared lounge, a large screen poolside, a tour desk and laundry facilities. The property offers free parking and a rooftop terrace with hammocks. The property also has a surfing school and is built following an eco-friendly design. Juan Santamaría International Airport is 1 hour and 30 minutes’ drive away. We speak your language! 15 rooms available. 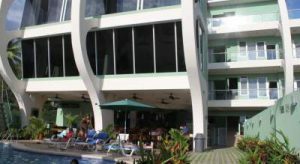 Set on Jaco Beach, Morgan´s Cove Resort & Casino features rooms with balconies, 2 outdoor swimming pools and a restaurant. Each spacious, air-conditioned room at Morgan´s Cove Resort & Casino has bright, Caribbean-style décor. There is a seating area with satellite TV, a coffee maker and free Wi-Fi. Guests can enjoy an American breakfast and international cuisine in the Black Beard Lounge and Restaurant. There is also a bar in the casino, and drinks are served by the pool. San Jaco has a wide range of shops, bars and restaurants. 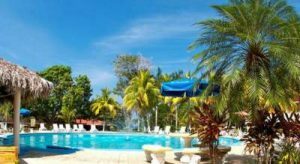 Staff at Morgan’s Cove’s reception can arrange trips to Manuel Antonio National Park and Vista Los Suenos Rainforest Canopy. Carara Nature Reserve is a 30-minute drive from the resort, while Playa Herradura Beach is 10 km away. San Jose can be reached in less than 90 minutes by car. 80 Hotel Rooms available Accommodation. The rooms offer a TV, a balcony and cable channels. Featuring a shower, private bathrooms also come with towels. You can enjoy a garden view from all the rooms. Extras include linen and a fan. Guests can enjoy the on-site restaurant, and other options can be found within 500 metres. 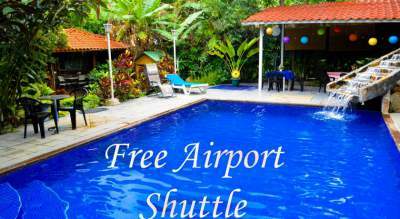 At Hotel Brillasol Airport you will find free airport shuttle service, a 24-hour front desk and a garden. Other facilities offered include a tour desk and luggage storage. The property offers free parking. Juan Santamaría International Airport is 5 km away. from € 40 Average price per night. Top 10 Costa Rica Beaches. Our Top 10 Costa Rica Beaches are here! Frog TV brings you some of the best, unmissable beaches that you must visit in Costa Rica! Take A Break Holidays takeabreakholiday, Hotel Accommodation. San Francisco De Asis, Urb Marina, San Fulgencio, 03177, Alicante, Spain.